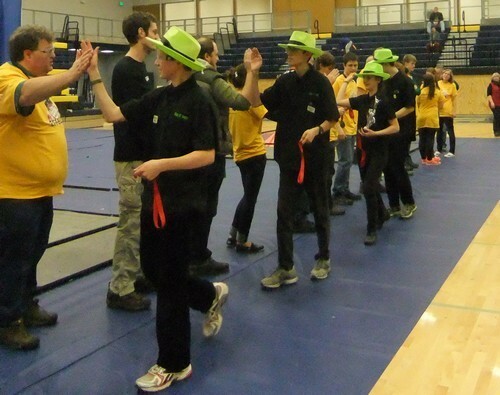 This season, the FIX IT team was part of the Knuth League in northern Washington State. After playing two league events (16 matches), 3491 was ranked 7th in our district. The next event was the Pasteur District Championship on Jan. 11, 2015. We were delighted when the Swerve Robotics teams invited us to spend the day before the District Championship at their work shop. It gave us lots of time to test on an actual field. Our day started with check-in, when we found out that our judging time slot was less than half an hour away. The whole team focused on getting the robot set-up and ready for judging. The interview went well and Larry worked so that we could demonstrate all the mechanisms. From there it was inspections and testing on the field. Most of our matches went very well, with our alliance often scoring over 300 points. Being able to fill the centre goal in end game makes a big difference to the out come of most matches. We knew the matches had been going well, but we were surprised to discover that we were top of the rankings. The final match of the day changed the rankings again, and we were delighted to be the 2nd ranked team once everything was totaled. Helen was our Captain and made the final choices about who would be in our alliance. For the alliance selection, we chose 6257- 2 Saints and 9093- Decaforce. We lost the first elimination game but made up for it by winning the next two matches. In the finals, our alliance lost the first match, but were delighted to win the second match. After two and a half suspenseful minutes and then about five more nerve racking minutes we lost the final match 338p to 374p. During the award ceremony, we were nominated for PTC Design, Motivate, and Innovate awards. We were thrilled to win the Inspire award! Thanks to all the officials, volunteers, and teams for making it such a great day! This page contains a single entry by Christine published on January 19, 2015 4:44 PM. Kick-Off 2014 was the previous entry in this blog. State 2015 is the next entry in this blog.